Ostad Asadolah-Malayeri, H., Hakemi-Vala, M., Davari, K. (2016). Role of Aders and OXA23 Genes among Imipenem Resistant Acinetobacter baumannii Isolates from Two Hospitals of Tehran, Iran. Iranian Journal of Pathology, 11(4), 345-353. Helia Ostad Asadolah-Malayeri; Mojdeh Hakemi-Vala; Kambiz Davari. "Role of Aders and OXA23 Genes among Imipenem Resistant Acinetobacter baumannii Isolates from Two Hospitals of Tehran, Iran". 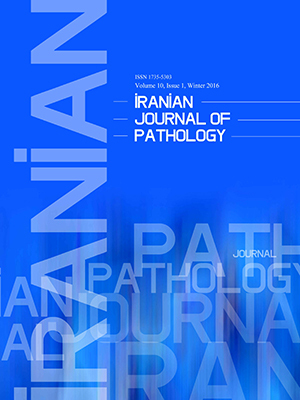 Iranian Journal of Pathology, 11, 4, 2016, 345-353. Ostad Asadolah-Malayeri, H., Hakemi-Vala, M., Davari, K. (2016). 'Role of Aders and OXA23 Genes among Imipenem Resistant Acinetobacter baumannii Isolates from Two Hospitals of Tehran, Iran', Iranian Journal of Pathology, 11(4), pp. 345-353. Ostad Asadolah-Malayeri, H., Hakemi-Vala, M., Davari, K. Role of Aders and OXA23 Genes among Imipenem Resistant Acinetobacter baumannii Isolates from Two Hospitals of Tehran, Iran. Iranian Journal of Pathology, 2016; 11(4): 345-353. Background: This study aimed to evaluate the role of efflux pump regulator and OXA-23 genes in imipenem resistance Acinetobacter baumannii strains isolated from hospitalized patients in Tehran, Iran. Methods: This study was conducted on 60 A. baumannii isolates collected from patients admitted to the Shahid Motahari and Taleghani Hospitals in Tehran during 2013-14. Antibiotic susceptibility tests (AST) and minimal inhibitory concentration (MIC) was determined by broth micro dilution methods according to CLSI 2014 guidelines. The frequency of efflux pump adeRS and OXA-23 genes were detected by PCR and further sequencing. Results: The resistance of A. baumannii isolates to tested antibiotics was 100% to cefotaxime, ceftazidime, ceftriaxone, ciprofloxacin, cefepime, piperacillin, meropenem, co-trimoxazole and piperacillin/tazobactam, 97% to imipenem, 94% to gentamicin, 83% to amikacin, 76% to tetracycline, and 0.0% to colistin. The MIC of 58 (96.6%) strains to imipenem was highly decreased in the presence of efflux pump inhibitor (PaβN), by 4 to 64 folds. The adeR and adeS genes were detected in 36 (60%) and 59 (98.3%), respectively and the frequency of OXA-23 gene was 57 (95%) of isolates. Conclusion: Existence of adeRS and OXA-23 genes in more than 50% of A. baumannii isolates in this study shows the presumptiverole of efflux pump in simultaneous of carbapenemase production. Therefore, using new strategies are required in order to stop the vertical or horizontal exchanges mentioned genes from the resistant A. baumannii isolates to sensitive strains. Feng Z, Jia X, Adams MD, Ghosh SK, Bonomo RA, Weinberg A. Epithelial innate immune response to Acinetobacter baumannii challenge. Infect Immun 2014; 82(11): 4458-65. E. Bergogne-Berezin, K. J. Towner. Acinetobacter spp. as Nosocomial Pathogens: Microbiological, Clinical, and Epidemiological Features. Clin MicrobioRev 1996; 9(2): 148–165. Evans BA, Hamouda A, Amyes SG. The rise of carbapenem-resistant Acinetobacter baumannii. Curr Pharm 2013; 19(2): 223-38. Nordmann P, Poirel L. Carbapenem resistance in Acinetobacter baumannii: mechanisms and epidemiology. Clin Microbiol Infect 2006; 12(9): 826-36. Woodford N, Ellington MJ, Coelho JM, Turton JF, Ward ME, Brown S, et al. Multiplex PCR for genes encoding prevalent OXA carbapenemases in Acinetobacter spp. Int J Antimicrob Agents 2006; 27 (4); 351–353. Kuo HY, Chang KC, Kuo JW, Yueh HW, Liou ML. Imipenem: a potent inducer of multidrug resistance in Acinetobacter baumannii. Int J Antimicrob Agents 2012; 39(1): 33-8. Sun JR, Perng CL, Chan MC, Morita Y, Lin JC, Su CM, et al. A Truncated AdeS Kinase Protein Generated by ISAba1 Insertion Correlates with Tigecycline Resistance in Acinetobacter baumannii. PLoS One 2012; 7(11):1-14. Damier-Piolle L, Magnet S, Bremont S, Lambert T, Courvalin P. AdeIJK, a resistance-nodulation-cell division pump effluxing multiple antibiotics in Acinetobacter baumannii. Antimicrob Agents Chemother 2008; 52(2): 557-62. Performance standards for Antimicrobial Susceptibility Testing (CLSI); Twenty-second Informational Supplement. Wayne, PA, USA: Clinical and Laboratory Standards Institute. CLSI Document M100-S24. 2014, 32(3). Valentine SC, Contreras D, Tan S, Real LJ, Chu S, Xu HH. Pheno­typic and molecular characterization of Acinetobacter bauman­nii clinical isolates from nosocomial outbreaks in Los Angeles County, California. J Clin Microbiol2008; 46(8): 2499–507. Vaneechoutte M, Dijkshoorn L, Tjernberg I, Elaichouni A, Vos PD, Claeys G, et al. Identification of Acinetobacter genomic species by amplified ribosomal DNA restriction analysis. J Clin Microbiol 1995; 33(1): 11–15. Szabo D, Silveira F, Hujer AM, Bonomo RA, Hujer KM, Marsh JW, et al. Outer membrane protein changes and efflux pump expres­sion together may confer resistance to ertapenem in Enterobac­ter cloacae. Antimicrob Agents Chemother2006; 50(8): 2833–5. Hou PF, Chen XY, Yan GF, Wang YP, Ying CM. Study of the correla­tion of imipenem resistance with efflux pumps AdeABC, AdeIJK, AdeDE and AbeM in clinical isolates of Acinetobacter baumannii. Chemother2012; 58(2):152–8. Shahcheraghi F, Abbasalipour M, Feizabadi M, Ebrahimipour G, Akbari N. Isolation and genetic characterization of metallo-beta-lactamase and carbapenamase producing strains of Aci­netobacter baumannii from patients at Tehran hospitals. Iran J Microbiol2011; 3(2): 68–74. Rajamohan G, Srinivasan VB, Gebreyes WA. Novel role of Acinetobacter baumannii RND efflux transporters in mediating decreased susceptibility to biocides. J Antimicrob Chemother 2010; 65(2):228-32. Lee Y, Yum JH, Kim CK, Yong D, Jeon EH, Jeong SH, et al. Role of OXA-23 and AdeABC efflux pump for acquiring carbapenem resistance in an Acinetobacter baumannii strain carrying the blaOXA-66 gene. Ann Clin Lab Sci 2010; 40(1): 43-8. Gholami M, Hashemi A, Hakemi-Vala M, Goudarzi H, Hallajzadeh M. Efflux pump inhibitor phenylalanine-arginine ß-naphthylamide effect on the minimum inhibitory concentration of imipenem in Acinetobacter baumannii strains isolated from hospitalized patients in Shahid Motahari burn hospital, Tehran, Iran. Jundishapur J Microbiol 2015; 8(10): 1-7. Lais Lisboa Correa, Larissa Alvarenga Batista Botelho, Livia Carvalho Barbosa, Claudio Simoes Mattos, Jupira Miron Carballido, Carmem Lucia Teixeira de Castro, et al. Detection of blaOXA-23 in Acinetobacter spp. isolated from patients of a university hospital.Braz J Infect Dis 2012; 16(6): 521-6. Al-Agamy MH, Shibl AM, Ali MS, Khubnani H, Radwan HH, Livermore DM. Distribution of β-lactamases in carbapenem-non-susceptible Acinetobacter baumannii in Riyadh, Saudi Arabia. J Glob Antimic Resis2013; 2(1):17-21. Lin MF, Chang KC, Lan CY, Chou J, Kuo JW, Chang CK, Liou ML. Molecular Epidemiology and Antimicrobial Resistance Determinants of Multidrug-Resistant Acinetobacter baumannii in Five Proximal Hospitals in Taiwan. Jpn J Infect Dis 2011; 64(3): 222-7. Yoon EJ, Courvalin P, Grillot-Courvalin C. RND-type efflux pumps in multidrug resistant clinical isolates of Acinetobacter baumannii: major role of AdeABC overexpression and AdeRS mutations. Antimicrob Agents Chemother 2013; 57(7): 2989-95.